How marvelous! 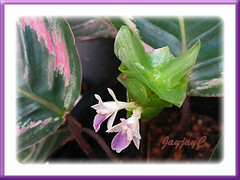 Our potted Calathea roseo picta cv. ‘Eclipse’ started flowering for the first time ever in October! Previously flowerless for more than 2 years in our garden. And so timely too, especially cheering my cheerless heart where I have been so sick for almost 3 weeks and unable to enjoy and potter around the garden at the front yard. Hence, these Rose Painted Calathea as they are commonly named, with their pretty flowers, located at the courtyard, adjacent to our dining hall have been truly a booster to my drooping spirit. Wow! 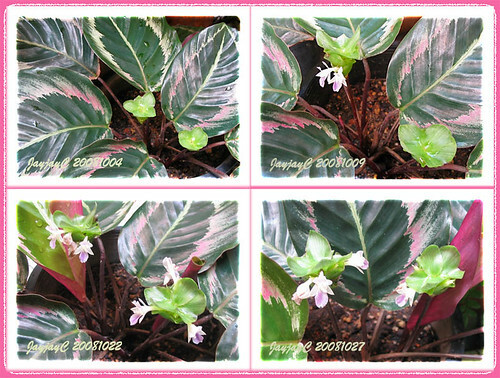 Such a wonderful surprise, just 2 weeks after we had known that Calathea roseo picta does produce flowers after all. This fact surfaced when I was researching online to write about this beauty that is popularly grown for its exquisite variegated leaves instead. Unbelievably generous too! Must have thought that it was about time to reward us big time for our tender loving care, yes? Even one flowering stalk would have been enough to mesmerize us, but instead our potted plants happily gave us two wonderful stalks and abundant flowers to enjoy and be totally bewitched! We are truly impressed. 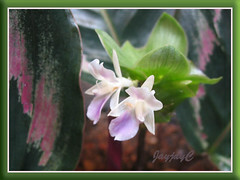 Though flowers are tiny (about 1cm across), dressed in soft white and purple tones and remain fresh for only a day, the continuous supply of new ‘dancing girls’, peeping out from the apple-green bracts held atop reddish-brown stalks (13-15cm long) every morning since early October and still prolific till this very day, really amazes us. Such persistent cheerleaders! Thank you so much, Lord Jesus for this blessed experience! To see and enjoy these beautiful blooms for real is absolutely fabulous!